Sponsors - AN ART PROMOTIONS PRODUCTION: CHRISTMAS RIDE, a Feature Film CHRISTMAS RIDE (PG), family road trip movie produced by Art Promotions in cooperation with Yarbrough Media Productions. Academy Award Qualified Feature Film, 108 mins, DCI, DCP, forgiveness. ghosts, angels. cops & robbers, artist, veteran. Dove says ages 12+ Faith and Family seals. Contact Art Promotions at 901 859-2316 or write kfrancis427@gmail.com An inspirational feature film, CHRISTMAS RIDE, a road trip to remember, now theater ready in DCP format, rated PG by MPAA. Advertising Sponsors needed for trailer TV Campaign. Last chance. 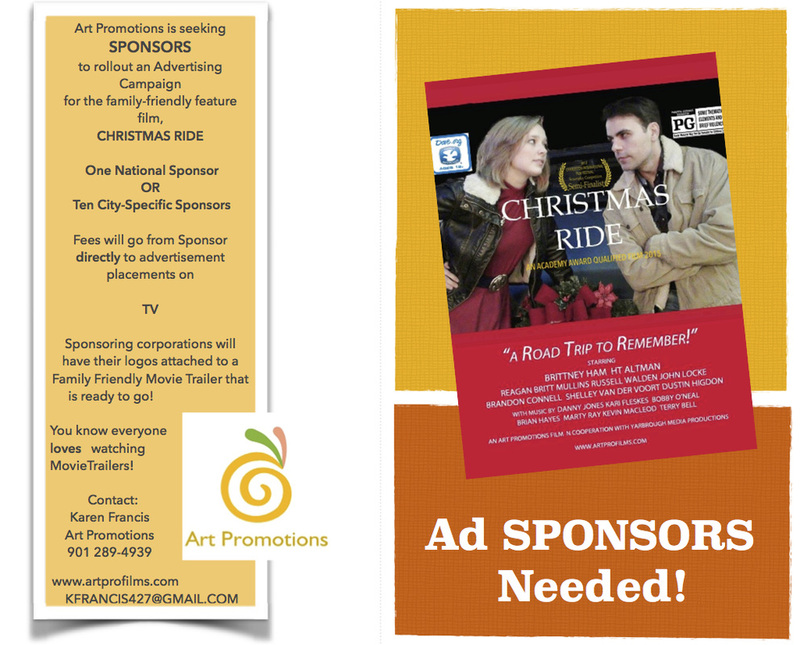 Art Promotions is seeking sponsors for a wide cinematic rollout of the feature film, CHRISTMAS RIDE. National sponsor OR City specific ones. Help bring this great family film to your city. Funding will go from sponsors toward advertisement placements on TV, print, and radio. The Creative Work is done already! ​For additional information, write kfrancis427@gmail.com or call 901 289-4939.